Depression is a disorder that requires action to be taken. People with depression who make dietary and lifestyle changes tend to recover quicker than those who do not. Additionally, maintaining an ongoing recovery treatment plan helps to reduce relapse. Virtually every type of exercise has been shown to significantly help alleviate depression. Whether it’s traditional exercise such as weight lifting or alternative exercise like yoga, exercise has the ability to increase heart rate. Studies have found that when heart rate is increased for a few hours every week it can boost the body’s natural mood-enhancing chemicals such as endorphins. These chemical substances are one of the ways that exercise helps depression. A number of large reviews of thousands of studies on exercise and depression have proven that exercise is a significant means of reducing depressive symptoms. Available evidence suggests that almost any type of exercise attenuates depression. In a study at Concordia University in Montreal, moderately depressed elderly subjects who began walking regularly had a significant improvement in mood. 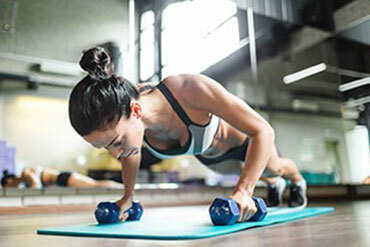 Research at Duke University Medical Center compared the benefits of an exercise training program with those of prescription antidepressant medication. One hundred fifty-six men and women with major depression were assigned to an exercise group or placebo. At the 16-week mark, it was concluded that exercise was as helpful in reducing depression symptoms as taking antidepressant medications. Other studies have found that exercise can help depression almost immediately, something that can’t be said for most other forms of treatment. A study at Northern Arizona University in Flagstaff revealed that exercise improved mood in as little as ten minutes and mood continued to get better for up to twenty minutes. In a Berlin study, depression improved after participants walked on a treadmill for thirty minutes a day for only ten days. By comparison, antidepressant medication often takes at least two to three weeks to begin improving mood. Follow-ups after studies have showed that improvement in mood from exercise lasts for as long as regular daily exercise is continued. A study in which participants walked every day for two months found that the decrease in depressive mood was still shown at a five month follow-up. When the participants kept up exercising, their mood improved even more over the following months. It doesn’t necessarily take a lot of exercise to improve depressive symptoms. One study revealed that as little as three hours per week of aerobic exercise can significantly reduce the level of depression. In general, exercise is considered an alternative treatment for depression because it is an alternative to medication. However, some types of exercise are even more alternative than others. The ancient Chinese practice of Qigong (pronounced “chee gung”), which involves meditation, breathing exercises, and body movements, can reduce the symptoms of depression. The practice has existed for centuries as a way to cultivate inner strength and relaxation, to ward off disease, and to promote longevity and well-being. In a study at Hong Kong Polytechnic University, participants who practiced Qigong for 8 weeks experienced improved mood, self-confidence, self-esteem, personal well-being, and physical health compared with those in a newspaper-reading group. The source of depression in traditional Chinese medicine is generally related to the liver and doing Qigong can help move the liver qi. Pronounced “chee,” qi is the Chinese word used to describe energy. Another form of exercise similar to Qigong is Tai Chi. Tai Chi, shortened from “Tai chi chuan,” is a martial art that has been practiced in China for centuries. Studies have indicated that Tai Chi can help reduce the incidence of depression and mood disturbances. The benefits of Tai Chi extend beyond those of simply exercising. The combination of exercise, meditation, and breathing all play a role in the relief of depression. A study at the University of Hong Kong found that regular Tai Chi exercises helped improve mood in a group of older patients with depressive disorders. In a number of clinical studies, Tai Chi has been particularly effective in improving self-esteem and health-related quality of life in older populations. Yoga is another form of exercise that has been practiced for thousands of years. Yoga is a relaxing and invigorating form of exercise that helps to alleviate depression. The postures and meditative aspects of Yoga address the root cause of depression by calming the nervous system, stimulating circulation, promoting concentration, and energizing the mind and body. A depression and exercise research project determined that yoga can significantly reduce depression. In the study, participants practiced yoga exercises for ten months. The results indicated an improvement in depression, anxiety, and mental function. In another study, hatha yoga was as effective as electroconvulsive therapy and the antidepressant imipramine. Researchers from the University of California, Los Angeles, Moscow Research Center of Narcology, and the University of Bologna in Italy joined together to study the benefits of yoga in people with depression. In the study, yoga was a useful intervention for depression because it was cost-effective and easy to implement. It produced many beneficial emotional, psychological and biological effects. Regular exercise can help you control your depression as well as reduce your risk of heart disease, and strengthen your bones and muscles. But if it’s been awhile since you’ve exercised and you have any health issues or other concerns, it’s probably a good idea to talk to your doctor before starting a new exercise routine. Arcos-Carmona, I.M., Castro-Sánchez, A.M., Matarán-Peñarrocha, G.A., Gutiérrez-Rubio, A.B., Ramos-González, E., Moreno-Lorenzo, C. (2011). Effects of aerobic exercise program and relaxation techniques on anxiety, quality of sleep, depression, and quality of life in patients with fibromyalgia: a randomized controlled trial. Med. Clin. 2011;137:398–401. Babyak, M., Blumenthal, J.A., Herman, S., Khatri, P., Doraiswamy, M., Moore, K., Edward Craighead, W., Baldewicz, T.T., Ranga Krishnan, K. (2000). Exercise treatment for major depression: Maintenance of therapeutic benefit at 10 months. Psychosom. Med. 62:633–638. Baek, I.-H., Lee, T., Song, M., Goo, B.-O. (2014). Effect of circuit class training for eight weeks on changes in ratios of F-Trp/BCAAs and depression in people with poststroke depression. J. Phys. Ther. Sci. 26:243–246. Chan, W., Immink, M.A., Hillier, S. (2012). Yoga and exercise for symptoms of depression and anxiety in people with poststroke disability: a randomized, controlled pilot trial. Altern. Ther. Health Med. 18:34–43. Kelley, G.A., Kelley, K.S., Hootman, J.M. (2015). Effects of exercise on depression in adults with arthritis: a systematic review with meta-analysis of randomized controlled trials. Arthritis Res. Ther. 2015;17:21. Liu X, Clark J, Siskind D, Williams GM, Byrne G, Yang JL, Doi SA. (2015). A systematic review and meta-analysis of the effects of Qigong and Tai Chi for depressive symptoms. Complement Ther Med. 2015 Aug;23(4):516-34. Wang F, Lee EK, Wu T, Benson H, Fricchione G, Wang W, Yeung AS. (2014). The effects of tai chi on depression, anxiety, and psychological well-being: a systematic review and meta-analysis. Int J Behav Med. 21(4):605-17.